MUNK (Munck), JENS ERIKSEN, Danish sailor, wintered at the mouth of Churchill River in 1620; b. 3 June 1579 at Barbo, near the present Arendal, Norway; second son of Erik Nielsen Munk; married Katherine Adriansdatter; divorced 1623; several children; d. 3 or 24 June 1628 and buried 3 July in Copenhagen. Munk’s early years were spent at sea. During the war with Sweden, 1611–13, he was commissioned a captain in the Danish navy, where he distinguished himself. From 1613 onwards he fulfilled various official duties at the command of his sovereign, Christian IV. He became actively interested in the arctic whale fisheries, in view of the profits that could be made, and was the first to introduce whaling as an industry to Denmark. In 1619 Munk was instructed by Christian IV to make a voyage in search of the northwest passage to India. Munk chose two navy vessels, the Enhiörningen (Unicorn or Narwhal), a small frigate, and the Lamprenen (Lamprey), a sloop, which were outfitted under his own supervision. He set out in May 1619, sailing north of the Shetlands, past the Faeroes, and west towards Greenland. He sighted Kap Farvel (Cape Fare-well), 30 June, ten days after nearing Greenland. By 8 July he had sighted the western shore of Davis Strait, but was prevented from approaching land by ice and fog. When the weather cleared he sailed into Frobisher Bay thinking it was Hudson Strait. On discovering the error he sailed south until he was satisfied that the strait had been reached. Munk gave the name “Fretum Christian” to Hudson Strait. He perilously followed the north shore of the strait between the ice and the land. At a place called by Munk “Rinsund” he anchored and went ashore to talk to the natives, probably transient Eskimo, and to shoot reindeer. Munk took possession of this land in the name of Christian IV, setting up the king’s arms and monogram brought for the purpose. After leaving Rinsund he was caught in the ice for six days. He explored a small cove, which he called “Haresund” 31 July, until the weather improved. There he found metalliferous rocks and tale. The position of Haresund is not precisely known. Munk started out again 19 August to the WSW. His pilots thought they were in Hudson Bay, but Munk was not sure. Actually they were in Ungava Bay. After rectifying this mistake they made no more navigational errors. With adverse winds it took six days to regain the strait, and Hudson Bay was entered near Digges Island. Munk called the whole of what is now known as Hudson Bay “Novum Mare Christian.” At this time only the southern portion was known as “Hudson’s Bay”; the western part was called Button’s Bay. Munk’s account of the bay is the first to treat the inland sea as a whole, and his map the first on which the whole of the bay is depicted. Munk was the first European to visit the area, though Button may have passed by in 1612 and 1613 without taking note of it. While wintering there Munk recorded various scientific observations and opinions such as the migrations of birds, an eclipse of the moon, parhelions, and his views on the origins of the icebergs he had seen in Davis and Hudson straits. Munk encouraged his men to hunt and take exercise, but as the weather grew colder and the snow deeper they were confined to their ships. By January 1620 the men were beginning to succumb to scurvy. Though the ships had adequate stores of herbs, waters, and medicines, no one knew how to administer them. By March half the crew were dead, and by 4 June 61 had perished, leaving only Munk and two others, who were weakened by the disease. However, they recovered sufficiently to attempt a return to Europe in the sloop. Munk’s account of the homeward voyage is meagre. The course followed was much the same as that of the outward voyage. He reached Norway 21 Sept. and by 25 Dec. was again in Copenhagen. Munk was naturally disappointed in the failure of the expedition. He had not been prepared for the extreme cold – worse than he had experienced on his unsuccessful voyages to Novaya Zemlya (New Land). Also, he had planned to live off the land and so have fresh meat. He later made plans to return to the area with colonists to initiate the fur trade there. He made various preparations for this second voyage but it was postponed for several reasons. The year 1623 saw him again sailing under King Christian’s orders. In 1625 he was commissioned admiral and stationed on the Weser during the Thirty Years’ War. 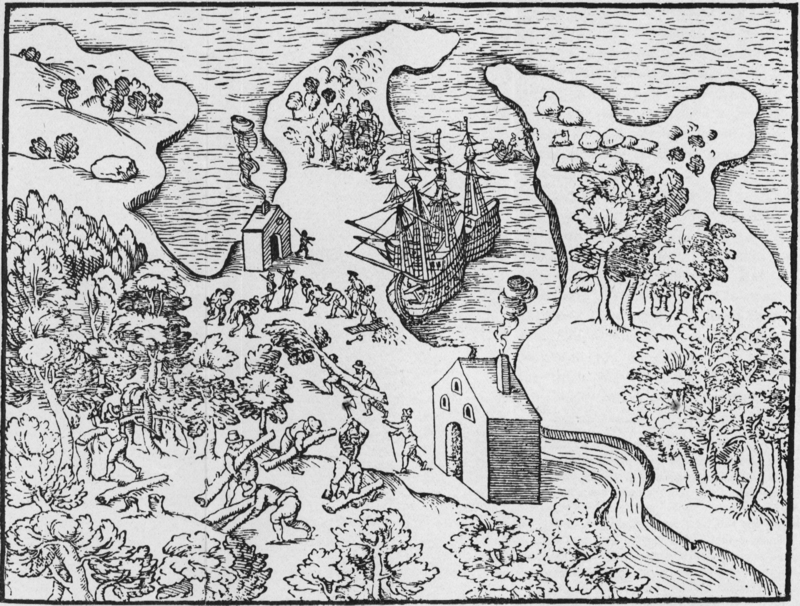 Danish arctic expeditions (Gosch), II: The expedition of Captain Jens Munk to Hudson’s Bay in search of a north-west passage in 1619–20, contains the most complete account of Jens Munk’s life, together with a translation of his own account of his voyage, Navigatio septentrionalis, originally published in Copenhagen in 1624. The 2d ed., edited anonymously and published in 1723, includes a biography of Munk, which is believed to be extracted from his own journals. 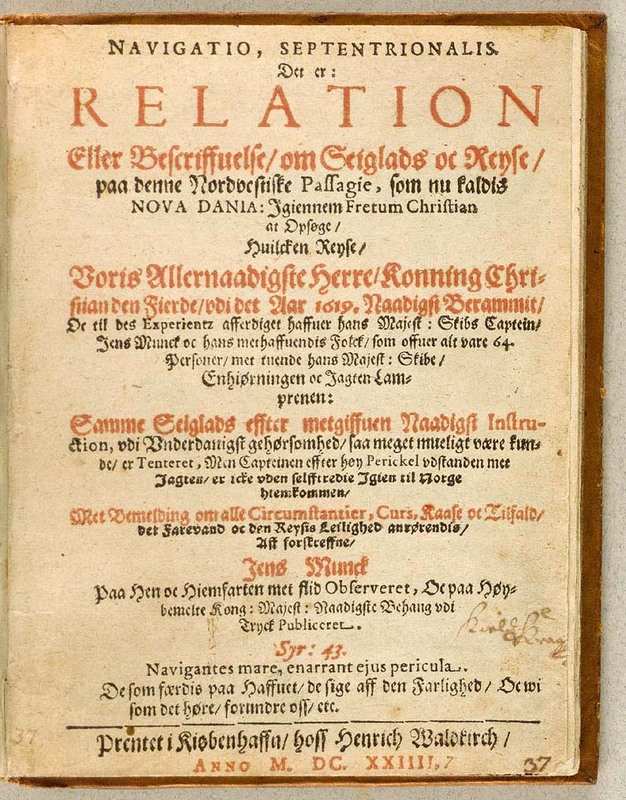 A 3d ed., consisting of an accurate reprint of the 1624 ed., was published in Copenhagen in 1883, with an Introduction And notes by P. Lauridsen, who included “some interesting additional information” found in the Danish State Archives. Munk’s original, auto-graphed MS, including most of the text, is the property of the University Library in Copenhagen. For a lively, modern account see Dodge, Northwest by sea, 144–53. Oleson, Early voyages, 171–72. Nora. T Corley, “MUNK, JENS ERIKSEN,” in Dictionary of Canadian Biography, vol. 1, University of Toronto/Université Laval, 2003–, accessed April 24, 2019, http://www.biographi.ca/en/bio/munk_jens_eriksen_1E.html.